What Do Baby Birds Eat - How To Feed Wild Baby Birds and Food? WHAT DO BABY BIRDS EAT - How to feed wild baby birds & Food? Normal wild perching birds that naturally feed on seed, fruit and wild berries will feed baby birds with insects and worms as supplement. Baby birds eat insects like grasshopers, flyes and snails to provide extra protein for baby bird growth. Birds grow at a fast rate and extra protein boost helps with that. Baby birds have quite demanding diet needs, it will depent on their age and species, baby birds will eat every 15-20 minutes for 12 hours every day, eating a diet rich in insects for sufficient protein to ensure the fast growth rate. In case you find a hatchling or young bird which seems abandoned by its parents, at first just leave it alone. Move away and observe if its parents are coming down to feed it; in a certain period the parent birds may leave the younglings to encourage them to find their own food. However, if the bird is in danger (from cats for example), move it to an elevated safe place, or put it in a cage or box someplace where its parents can reach it. Sometimes you will find on the ground baby birds which have not yet developed any feathers. These are most often martins or sparrows, and the best solution is to return them to their nest. The parents are unable to do anything for birds that young if they’re not in the nest, so it is up to you to do something. If however you are unable to find their nest, you should try to help them. In date case you must provide similar nutrition to its natural diet. Hand Feeding Bird Food works the best. How to feed baby birds. 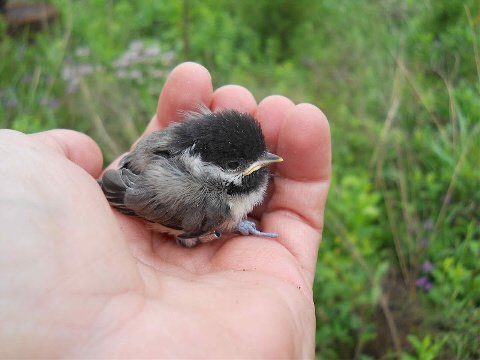 Feeding and taking care of abandoned baby birds is a highly specialized assignment and it is best to leave it to professionals with experience if you can. 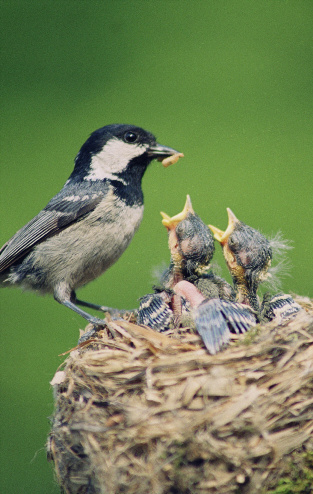 In the nest, baby birds are fed by their parents, mostly on grubs and insects. As it is obviously impossible to gather enough insects to keep a growing baby bird fed, you can make a very good Baby Bird Food substitute. We call it “glop”. In my life I have managed to raise some birds and I cannot stress enough how important is proper diet for baby birds. Some of my birds died because I wasn’t giving them the right food. If you do not know how to make baby food, just think of the bird and buy the proper food. You have two choices, to make the food yourself or to buy comercial food. Add a few drops of High Potency Multi-Vitamin Bird Supplement for birds. Liquefy all the ingredients until you get something similar to soft ice cream and freeze. Before feeding it to birds thaw it slowly. However, an easier method is simply buying Exact Hand Feeding Bird Food Pet Type: Baby Bird from amazon or local store. That way you will have a good mix which contains DHA and omega 3 fatty acids needed for the development of the bird’s vital organs. This is a fully nutritious diet made especially for little birds and you can’t go wrong with that. Step by step in baby bird feeding. Babies of perching bird species all gape with wide open beaks so that their parents can push food right into their throat. You can usually invoke this reflex by gently tapping the side of the bird’s beak, and then you push a small amount of the food mixture into its throat. Remember not to pick the bird up or feed it with your finger because that will make it imprint on you. You can use those tiny plastic spoons you get in cafes to stir drinks. One thing you must take special care of it not to allow any food to enter the bird’s glottis; that is the opening situated right behind its tongue. Try to keep the bird clean and don’t get any food on its feathers. You can use regular baby wipes to clean them. Baby birds have to be fed every 15-20 minutes from dawn to dusk. If the bird has had enough to eat it will stop gaping. Baby birds which yet have no feathers need a constant source of heat. These birds are almost imposible to rear so don’t hesitate to call as for advice or with problems. Larger birds which have feathers need to be kept in an isolated box at approximately 60 degrees Fahrenheit. You can best keep baby birds warm by using overhead lamps with ceramic bulbs. Most birds learn to fly before they are weaned, so take care not to let them go until you regularly witness them picking up seeds (if the bird is a seed eating species) or white maggots and wax worms (if the bird is an insect eating species). These kinds of foods should be gradually given to the bird as it grows. Besides identifying the correct food for the bird, it is also important to identify which species the bird belongs to, because some birds require a very specialized diet. Both these species need dead mammals or small birds to thrive, which can be quite difficult to manage. Their food might have to be cut into small pieces for the baby bird. Do not be surprised when birds of prey regurgitate pellets of indigestible bone and fur, which is normal. What do baby pigeons and doves eat? It differ from all other birds by the fact that they are reared on a diet of a milky substance which the parents produce in their throat. You can use the Tropican mixture for tiny birds and a mix of ground corn and water for larger ones. Using a syringe, squirt this mixture right into the pigeon’s crop. Do not attempt this if you have no experience with rearing birds. These are unique in the fact that they can pick up their food right after being hatched. It is enough to give them Chick Crumbs, which you can find in pet stores, and some drinking water. Take care not to let them bathe because their feathers are still not waterproof and this could cause them to get a cold. Among waterfowl, moorhens are the most difficult to rear so please give us a call. All these species require large amounts of puppy food or some other meat product. These birds are very intelligent, so take special care to avoid imprinting. Keep their contact with humans as rare as possible; avoid picking them up for feeding and use a spatula to give them food. Baby Sparrows & Starlings, Chickadee, Cardinals, Finch and others. What to feed a baby bird sparrow or a finch? If you are unwilling to make food for baby birds, there are formulas of baby food you can find at pet stores or online. You can order Exact Hand Feeding Bird Food Pet Type: Baby Bird online from Amazon or try to find it in local stores. If you order larger quantities of the formula, you will save money. Commercial baby formulas are usually rather costly, so as the bird grows you can increasingly mix in transitional foods, but while the bird is a baby the commercial formula may be your best option. How can I construct a makeshift nest for the bird? For babies with their eyes still closed: Take a small cardboard box, paper or plastic bow or even a shoebox. Put some paper towels on the bottom. (You can also use a soft cloth like a soft towel or a t-shirt). Never use terry cloth, although most towels are made from it, because the bird can entangle its toes or beak in the small loops. Now, construct a nest of appropriate size for your bird. You can use toilet paper or any similar tissues and wrap them around in a circular shape, placing the bird in the center. A good way of doing it is by wrapping the paper around your own hand and then placing it into the box. We use disposable paper tissues so we can change them often and keep the bird clean. If your bird is very young or is too sick to move, it will stay in the nest. When making a nest for very young birds make sure there is no extra space and that the nest fits tightly around the bird. The sides of the nest should be about two thirds the bird’s height and never be higher than the bird itself. If the height is right, baby birds will learn to perch on the nest and defecate outside. Now carefully place the bird in your nest. If you’re using a heating pad, set it on the lowest setting, cover with a towel and place the box with the nest on the top. For a baby songbird you want to achieve a temperature of about 85 degrees. You can monitor the temperature inside the nest with a meat thermometer allowing you to adjust the heating pad. The nest should be placed in a place sheltered from children and pets, a place which is quiet and dark, without air-condition and direct sunlight. Some good options for protecting the nest are a larger cardboard box, a plastic tote bag with holes for air, a pet carrier crate or even an upside-down laundry basket. All these will protect the birds from children and pets. Keep in mind that the baby birds can manage to get out of a laundry basket through the slits so you need to be extra careful. After securing the nest, leave the bird alone. For birds with their eyes open and little feathers: You can construct the same nest as we described above but keep in mind that these babies are starting to hop and flap around. So better place the nest in a pet carrier or a bird cage. You can get them very affordably on Craig’s List. In case you do not have a suitable cage, you can still make one out of an old laundry basket. To do this you will need the following: a laundry basket, a hot glue gun and a roll of window screening (fiberglass or pet safe). Cover all the holes on your laundry basket with cut out screening and hot glue them in place. If you don’t want to use hot glue, you can use tape but then you must make sure that there is no sticky tape inside the basket because the baby birds can injure themselves on it. Cover the bottom of the basket with newspapers and paper towels. The paper towels make cleaning easier and also help the bird to hop better because the newspapers are too slick. Construct a lid from the remaining window screening. You need to secure the lid from opening, either by using clothespins or an elastic cord. Make sure to place several branches into the basket but secure them somehow. These will allow the birds to perch but they need to be high enough so the bird’s tail feathers do not touch the ground. For active babies: As the babies get more active, they will need more room to move and learn to fly. For this purpose you can use a larger bird cage, or a playpen for children, a large cardboard box into which you’ll cut openings, a large plastic tote or even a dog cage with screening covering the openings. If you decide to use a playpen or a cardboard box, you can construct a lid from the same window screening we used earlier. Whatever you use, you can attach ropes and branches for the birds to perch on. Make sure that whatever you choose it will allow the birds to be exposed to sunlight. Sunlight provides vitamins essential for development but also plays a crucial role in making them happy. What do baby birds eat- feeding schedule : What time to feed a baby bird? 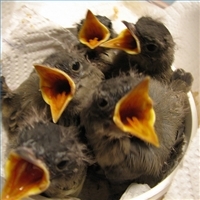 Hatchlings and nestlings should be fed every 15 to 20 minutes for 12 hours a day. This means that from 6 in the morning to 6 in the evening you need to feed the little ones every 15 to 20 minutes. The best way is to place a timer by the cage and remember to set it every time you feed them. If they are full, the birds will let you know. To ensure the babies proper development, you must absolutely maintain this schedule. The babies will sleep during the other 12 hours of the day so in the evenings you are released from your duties. Use a pair of tweezers and pick up small pieces of food, smaller by half than the birds beak, and give it to your bird. When feeding the birds with live worms, always crush the worm’s head before feeding it to the babies. Place the food on their bottom beak and wait for them to swallow it. Never shove the food into their throat or towards the throat, and do not try to fill up their beak because the birds DON’T chew their food. They just swallow it whole and it gets digested in the stomach. 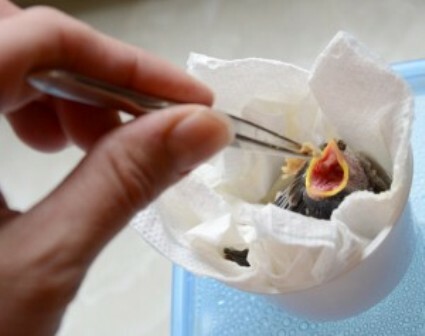 When you begin feeding baby birds, they might not want to take food from a stranger. Luckily, there are some tricks to make them eat. You can try mimicking the sounds babies make when they’re hungry, a high soft “tse tse” sound for hatchlings and a hight “tsepeep” for older birds. Also, try twitching the food in the tweezers around their head; that may make them open their mouth. Even before the baby birds open their eyes, they can see shadows so try to grab their attention by making shadows with your hand. Do not get worried if they won’t eat straight away. Just give them some time. But, if several hours later they still refuse food you have a problem. Call someone and ask for help. While feeding the birds, you will notice a bubble growing on the right side of their neck. That is the bird’s crop which is used for storing food and slowly passing it into the stomach. It is much more obvious in babies without feathers. Keep a close eye on it. If the bubble is still present at the next feeding, the bird might have a problem with swallowing its food. If so, take a watercolor paint brush, dip it into warm water and rub the OUTSIDE of the baby’s beak. There shouldn’t be any water dripping off the bird and you’re not trying to give it water to drink. Remember, its mother would never bring water to the nest. Most of the water they receive is from their diet and sometimes from rain. You can also try helping them to swallow by gently stroking them under the chin. We recommend you add a few drops of Multi-Vitamin Bird Supplement to the Baby Bird Food mix. This supplement will increase their immune system and provide vitamins needed for proper development. Poop One way of knowing if the food you’re giving the bird is adequate is the consistency of their poop. Although it may seem disgusting, this is an important way of monitoring the health of the animal you’re taking care of. Healthy excrement looks like a tadpole with a white jelly head and a dark tail. It should be firm enough to be picked up with tweezers. If it breaks, this might indicate you’re putting too much water into your food mixture. Also, the babies need some time to adjust to their new home and new diet, so for the first 24-48 hours their excrement will reflect the stress of that change. However, keep checking will it turn normal after a few days. I hoped you liked this what to feed a baby bird article.